To star or not to star? 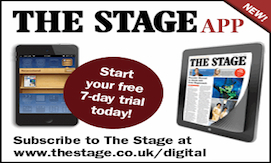 To star or not to star, that was the question which leading theatre producer and actor Guy Masterson was fulminating over at this year’s Edinburgh fringe. But while the veteran producer and performer was happy to grab any stars which came his way and plaster them all over his posters, he was far from happy with what they had come to represent. And, in the midst of a final week which did not carry the kind of full-on audience frenzy for his shows that he might have wished for, he decided that enough was enough, and he would attempt to get them banned. So there he was, creating a “Forum for Abolishment of Review Stars at Edfringe” on facebook, writing about the matter at great length in the Scotsman and telling anyone who would listen that either the star system must go, or it would be the end of the Edinburgh fringe as we know it. “We must reverse the status quo on stars,” he told The Stage. “All status quo’s can be reversed if we have a collective mind to it. The performers don’t want them because the value of a Hairline [an online fringe review site] review is the same as the value of a Scotsman review. The counter blast is simple: stars sell shows. From a publicist’s point of view it is a shorthand than lures passing trade to come and take a closer look – and Masterson is equally as prone to doing this himself as he announces every glowing report on his facebook page and twitter feed. From an editor’s point of view, they are not just a boon to the reader but there is no harm in seeing the name of the paper or website plastered on a billboard. 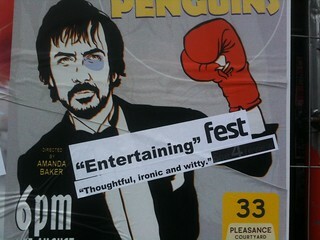 Even the Stage, which doesn’t give a star rating, has “must see” shows during the fringe – with piles of handy stickers, complete with Stage logo, to hand out to the willing promoters. The real questions concern what the stars actually mean. What is the real difference between a one star and a five star show? Do the reviewers of the different publications which give out stars have a common ground on which they do so? And do they give out more high-rated shows than they should? The answer is that there is little or no public announcement of what individual publications star systems are supposed to imply. 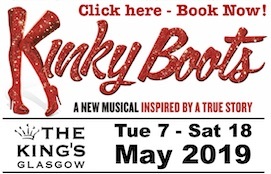 The Edinburgh Evening News carries a guide in the paper – from one star “Don’t bother”, through Average, Good, and Great to a five star “Kill for a ticket” – but there is nothing online on the Scotsman website, in which the reviews are published. The same is true for many of the larger websites – although there are a few notable exceptions. This website’s ratings are here. The List magazine publishes an online resource of how many shows are reviewed by each of a number of different websites – with a handy reference to the number of stars awarded. 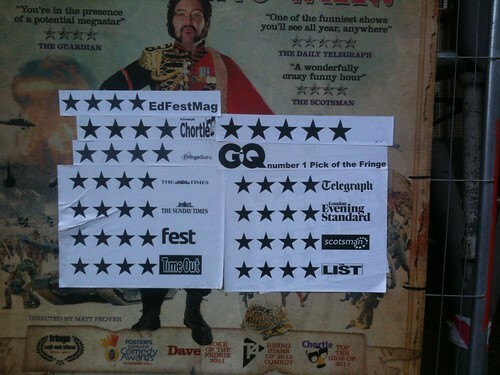 The site shows that not only has the number of reviews at the Edinburgh fringe risen hugely, but that the number of five star ratings has risen disproportionately. In 2009, 12 sites carried 1,382 reviews. In 2012, 20 sites carried 7,098 reviews. The fivefold increase has been reflected by a similar increase in four starred reviews. But five starred reviews have increased by six-and-a-half times, while reviews with one, two or three stars have increased only three or four times. It is this disproportionate increase in reviews giving high star-ratings which has lead to Masterson’s cri-de-coeur. The problem with his demands, as Kath Mainland the Chief Executive of the Edinburgh Festival Fringe Society told the Stage, is that with the increase in the number of shows on offer, the star ratings provide an invaluable tool for audiences. “I see them from both sides,” she says. “I can see that when you have a wallpaper of stars, it potentially becomes difficult to sort the wheat from the chaff. But our audience is pretty discerning and can understand from reading a review what they think of it. The star rating system certainly has its shortcoming, but it is too useful a tool for the Edinburgh fringe to try and do away with. The problem is that those shortcomings are getting more pronounced and the Fringe Society is not in a position to dictate to reviewers how to practice their art. However, as Kath Mainland points out, the job of the Society is to support the artists who come to the festival and the audiences who watch shows. If, by issuing a set of “best practice” notes to all publications and reviewers covering the fringe, it can get a bit of uniformity of purpose, that can only be a good thing. Those who publish the various fringe review websites already have their own forum in which to discuss such matters. Even if they don’t use the same criteria, at least stating what the criteria are, would be a start. As for the publicists, and that includes Guy Masterson, they should start believing in the reviews. As Masterson has pointed out, a balanced review from a well-informed critic (whether given stars or not) is as valuable as a five star shout from an impressionable student to a discerning punter. And it is those which they should use to sell tickets. 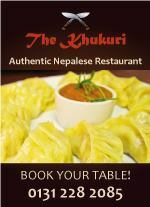 This feature was first published in the September 6 print edition of the Stage newspaper. Thom, my man… You and I go back a long way and (luckily) I have always admired your knowledge, eloquence and critical analysis. The one key element of my argument for the abolishment of the Star system – which is still its major flaw – and the one central element to my argument – which you omitted – instead choosing to say that I blamed the lack of “a full-on audience frenzy for his shows that he might have wished for” (Cute but inaccurate) was that, audiences generally don’t actually bother reading anything less than four star reviews – which is contrary to Kath Mainland’s argument that audiences are discerning enough to read the reviews and judge for themselves. 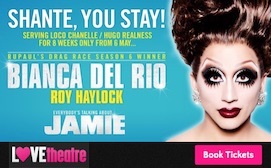 This means that the majority of the reviews at the fringe are simply a waste of time and space. If we really want the audience to decide for themselves, they could simply read the reviews and decide from the quality of the content. That would soon sort the good from the bad – shows and critics alike. Hence the star system is a shortcut to mediocrity. You did however gleefully point out my unfortunate hypocrisy in being forced to use them for fear of losing those audiences who rely on the stars in their eyes rather than reading the reviews themselves! I don’t mind… It’s still food for thought and the argument is far from settled!